This drives me absolutely bonkers. It’s sullying the book’s face! Stickers distract from cover art, and often cover some portion of writing on the cover and/or the back blurb. 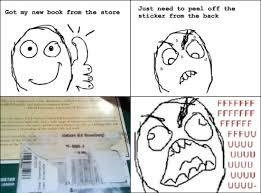 I cannot tolerate stickers on any books I own. As soon as I get home, I start peeling. I will spend a ridiculous amount of time removing stickers and residue (lemon essential oil works wonders.) Unfortunately, I have slightly damaged a couple of dust jackets in the process, and I find that preferable to the stickers. This one baffles me. It’s either laziness or indifference, both of which I find annoying, when the alternative is preserving a book’s condition.I’ve never been in a scenario where there isn’t one single thing within reach to use as a book mark: a kleenex, a receipt, a hair tie, a piece of toilet paper, just about anything will work to save your place. I especially despise the dog earring of library books. 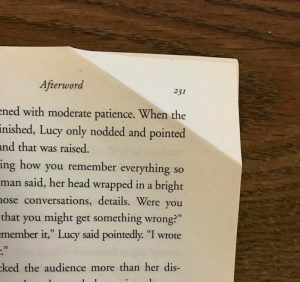 It’s distracting to the next reader, and permanently alters the book. 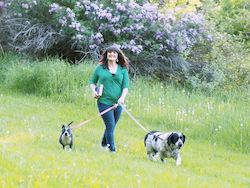 I realize that are stylistic reasons an author chooses to go this route. I’ve never encountered it in a book when it didn’t confuse me at some point, especially when there also aren’t any “he saids” either. I underline and write in my books. However, I always use pencil, and I’m only writing in books I plan to keep, usually for reference. I find others’ writing/highlighting distracting. I’ve become diligent about checking used books thoroughly because I’ve been disappointed many times to get part way through a book and encounter highlighting. It alters my reading experience because I’m paying extra attention to a high lighted passage, wondering why the previous reader found it significant. A few years ago, I bought a workbook on Amazon, and discovered it had been written in (in pen!) The irony is it was from the Highly Sensitive Person series, and the completed entries were about the death of the person’s mother. I immediately threw it out. 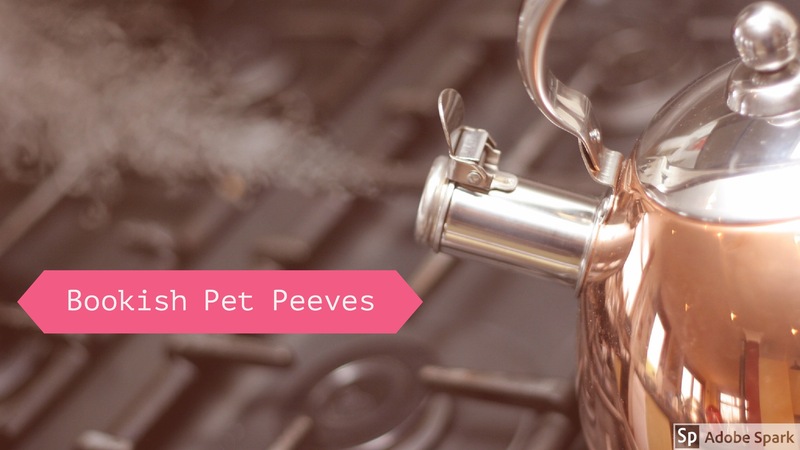 Do any of my pet peeves bother you when you’re reading? Do you have your own? I’m with you on #2 and #3. Sometimes I peel the stickers off and sometimes I don’t. It just depends on my mood. As to other people’s highlighting/ writing, I LOVE IT! It’s like a mini history of the book, right there for me to see. I love the part about figuring out what other people were thinking and why they wrote those notes, etc. The person was already infused in the book; this way I get to see it.